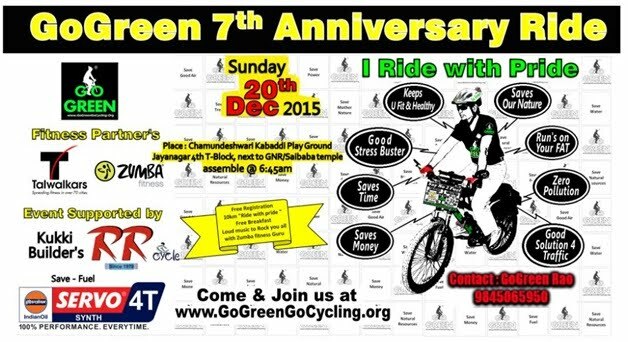 GoGreen Anniversary 20 Dec 15 "Ride with Pride" - GGI-Group size: 4000+ Professionals, Increasing on day to day basis, Come & join us 2 serve Mother Nature. 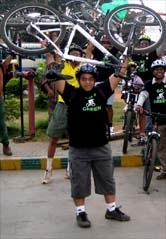 GoGreen Anniversary 20 Dec 15 "Ride with Pride"
Zumbo Fitness" for coming on board as Fitness Partners and Kukki Builders, RR Cycles & Indian Oil "Servo" for supporting us, and Last but not the least our GoGreen members with out your presence and participation's our 7th anniversary "Ride with Pride" wouldn't have been so successful . remembering our other beloved members whom we lost this year Umesh Byanna,Sanjay Rupanur & Shankar hope they watched and blessed us the ride success.. This is the quote which was reverberating in my mind when all the seventh anniversary celebrations of GoGreen Family came to an end. Just the preceding evening before the event, GoGreen Rao Sir and I were left in a dilemma when we saw another event going on in the same venue where our anniversary ride was proposed. We were hoping, we could start setting up of the stage and other decorations in the evening at 5pm and it will be over by 7pm, but to our dismay, I was waiting at the venue for over an hour and GoGreen Rao Sir hustled from venue to get the stickers ready and the ongoing event completed only by 8:30pm . So many things going on my mind , how will we setup everything for tomorrow morning and I was dejected about how all things will fall in place within the stipulated time and thinking of other Backup plans. But I saw this person who may be under pressure because it was his brainchild(GOGREEN CYCLING), but by his look he was in high spirits and by the help of the tent decorating people we could finish our stage and other decoration by 10:40pm.Then we went to have our dinner and GoGreen Rao Sir got a call from his sweet heart (his Daughter ) who reminded him of the anniversary cake, which I was not aware of and GoGreen Rao Sir though he was aware but completely forgot because of other commitments. He instantly called the baker and they agreed they ll handover the cake when we reach their bakery. At 11 pm we set off for the bakery on a bike and on the way we saw the police hitting a guy (which we mistook for drunken driving) and we went ahead but could not find the bakery. We took a U-turn and came through the same way and we saw a bakery which was about to close and the guy whom the police hit was the guy working in the bakery because it was not closed till 11pm. We felt so embarrassed about it, because of us the poor guy had to bear the brunt of police.Though I don't understand police never hit a rich guy or close the bars which were still open. We thanked them and felt so sorry for the guy and brought the cake which was big enough to fit in its cover and we took two to cover it and in the process it might have distorted the design on the top of the cake. On the day of the event when GoGreen Rao Sir was about to begin his ride on car to the venue, the car had no fuel and he had somehow managed to come to the gas station and made it to the venue. When I reached the venue around 6:30 am expecting the event to be started, I saw all my GoGreen family members busy with tying banners and doing the touch up works with Prasad Anna and Shashi Anna. I too joined them and met some new friends in the process and we made everything ready by 7am. In a while, Emcee Pandey took over the stage and cheered all the crowd with his antics and the local MLA Shri B.N Vijaya Kumar, Local Corporator's Shri C.K Ramamurthy, & Shri L Ramesh who were cordially invited to grace the occasion made their presence felt by starting the event with a speech on how cycling makes lives different and how important it is to give back to mother earth which has given so much to us. We had a moment of silence for our GOGREENIANS whom we lost this year but their souls will always live in our hearts. We had a warm up session by our sponsors TALWALKARS which was so good that even kids came on to stage to get a feel of warm up. Then we had a small ZUMBA session by SATISH DV with the song WE LL ROCK U, and I found another ZUMBA instructor dancing infront of me (PRAVEEN anna) , Srikanth Sir trying to avoid ZUMBA and BHASKAR Sir as usual was in another world (ZUMBASTIC). By then all our spirits were high and some were busy filling lucky draw coupons of Talwalkars and finally we all (including the MLA) were ready to start our annual ride. The ribbon cutting ceremony was done by Mr C. Madhav Rao (Father of our Founder) and all were set for a 10km ride except me and some others. ALL that was going in my mind was when the caterers will come because I had ensure everyone gets breakfast at the right time. 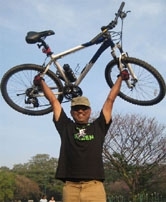 So I along with Prasad Anna, Shashi Anna, Swamy Anna, Tahir Bhai(motivating Kanaka Mam), Kanaka Mam, GoGreen Sweetheart and Shenoy Sir took a shorter route to finish the ride sooner than others. After everyone reached the venue after the anniversary ride, some members showcased their hidden talents like singing , one small kid showing us to drift with cycle and we were greeted with another superb performance by the ZUMBA team who set the stage on fire with the ladies dancing in the backdrop and all our members were enjoying the ZUMBA performance wishing it would be for some more time. After the Zumba Performance mementos and certificates were distributed to the newest entrants into the family (one of them being me) ,who would be inspired themselves as well as inspire others to take up cycling and promote sustainable environment, by the old members of GoGreen family. 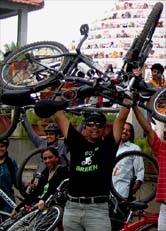 All the winners were very deserving and there may be many whom we have not have felicitated in this platform but they are making their presence felt in the realm of cycling and promoting Green culture. This felicitation is only a step forward to recognise people who have made a difference to others lives as well as theirs by taking to cycling and making this world a better place to live in . We left out one winner inadvertently though he was present there, (Natraj Sir from my family - Indian Air Force),our sincere apologies to you. He was presented the Memento and Certificate later. 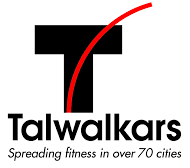 After felicitating the GOGREEN members we gave a token of appreciation to the people who shared this event with us, The TALWALKERS team and THE ZUMBA team who made the event more lively and had some group Snaps cheering each other and celebrating the passion for cycling. Then we had our breakfast which was behind the stage and the energy drink arranged by Prasad Anna which was the highlight. We ensured there was no litter around and we were ably helped by some volunteers whom I didn't recognise. After the breakfast was over most of our members bid Adieu and set off to their homes. I along with some GOGREENIANS (including Sunil KG) set off to Byrasandra lake to witness the lake cleaning process which was carried out under the aegis of Sunil KG. We had a ride around the lake and then met some officials who were incharge of the cleaning programme. We had a bike salute snap and also snaps with the people carrying out the cleaning and then we set off to our homes.
" When we love, we always strive to become better than we are. When we strive to become better than we are, everything around us becomes better too"
I narrated the incident before the event just to let us know that behind the smiles in our snaps there is lot of effort put in by many and let us all recognise it and the best way to reward them is to spread awareness among people to cycle and bring more people into the realm of cycling. Finally kudos to our leader and Family member GOGREEN RAO Sir for conducting the event successfully and thanks to each and everyone who was part of the event. 20Dec15 7th Anniversary "Ride with Pride"
Our GoGreen members who wanted to utalize this sponsored passes can avail this special facality at the following branches which is valid till 31st Jan 2016.
you can contact the branch incharge based on your home/office location.